Captain Pike Looks after the Baby! 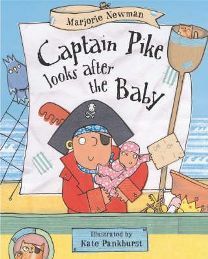 Well, you can probably tell from the title – ‘Captain Pike Looks after the Baby!’ that there is likely to be a certain amount of role reversal in this story! Mind you, as it is the 21st century, we should probably expect nothing less than daddies looking after babies, although in my experience it still seems to be mums that take the leading roles when looking after children! Anyway, as you will probably have realised by now, Captain Pike is a daddy who is left to look after his little girl. However, Captain Pike is no ordinary daddy, as he is also a rough, tough pirate who sails the seven seas fighting his pirate enemies. I think from the outset you can tell this is likely to be a funny story! Anyway, a brief outline of the story is as follows. Mrs Pike is an artist and is frantically trying to complete a painting for her gran’s birthday. In order to help her out, Captain Pike offers to look after the baby and take her on board his ship – the Green Beetle. He actually tells his wife that it will be ‘easy-peasy’ looking after the little girl! So they go on board ship and Captain Pike’s crew look on dubiously as he tells them they can all look after the baby! The crew have other ideas though, and when the baby cries, it is Captain Pike having to work out whether she needs feeding or changing and finding it not so easy after all! However, he manages to do a pretty fine job and gets the baby to sleep, warning all the crew to be quiet so as not to wake her! Unfortunately, there is another pirate ship approaching carrying Captain Pike’s arch enemy Captain Whitebeard. Both crews have a very noisy fight until Captain Pike’s head appears and shouts ‘Stop that noise! You’ll wake the baby!’ This is followed by some very loud howls by the baby herself! Surprisingly this stops all the fighting and both crews unite in trying to keep the baby happy! Captain Whitebeard even shares his childcare tips with Captain Pike! Eventually Captain Pike arrives home to his wife, totally exhausted and admits that maybe looking after the baby was not as easy as he thought! This is a very enjoyable story book which my almost four year old loves! She thinks that Captain Pike’s efforts to look after the baby are very funny and often comments that he’s not very good at it! She especially likes the pictures showing his efforts! She also likes the way that all the pirates stop fighting in order to look after the baby, and always says that it’s much nicer when they are not fighting! Every page is very well illustrated with bright colours and bold drawings. All of the different characters look quite funny and this adds to the humour! I guess in some ways this book is having a little dig at dads who think that looking after children is easy which is probably quite unfair in many cases. Certainly, my husband does not think it is easy and definitely emphasises with Captain Pike’s best efforts! So overall this is a happy funny book with plenty to look at and talk about on every page. There is some interesting language as well, with talk of lookouts, sea shanties and cutlasses. My daughter is at the stage where she wants to know everything and loves learning the meanings of new words, so this book is good for her in that way too! I would definitely recommend this as a good story to share with three year olds and above. No Comments on "Captain Pike Looks after the Baby!" My name is Jo and I have been married to Simon for nine years. We have two beautiful daughters – Rachel who is six and Natalie who is almost five and starting school in January. I also have two step children aged twenty one and seventeen so family life is never dull. I also manage to work three days for a local education authority where I support the teaching of literacy in primary schools. I love my job and it’s ideal for a book lover like me. In my spare time I run, dance and occasionally tread the boards with my local amateur dramatics group. My first love is reading though and you will never find me without a book on the go. My husband is also an avid reader and we are hoping to pass on our love of reading to our daughters. They certainly love their bedtime stories every night. Although I have and English degree and I am familiar with most of the classics, I generally read much lighter stuff these days. It’s mainly ‘chic lit’ but I also enjoy a good thriller or courtroom drama. I have so many favourite authors and this list tends to change regularly depending on what I am reading.